NAMM 2019: MXR has announced the Dookie Drive, a new stompbox that aims to recreate Billie Joe Armstrong's tone from the classic Green Day album of the same name. 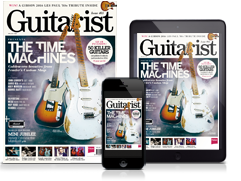 MXR says that it was able to borrow the actual amps used in the sessions for the R&D process, before they reproduced them in a pedal circuit. The original amp tone came from two modded Marshall Plexi heads, one of which became known as 'PETE' (due to the name being sprayed on the front). PETE was modded by LA Sound Design's Martin Goulub who replaced one of the master volumes with a gain knob and was paired with another modded Marshall, the two amps - one scooped, with gain, the other mid-heavy - were then blended in various ways across the record to create the final Dookie tones. The pedal recreates this process in two scooped and mid circuits, adding a blend knob and scoop switch for further control. Finally, it's all wrapped up in an enclosure that has been overlaid with Richie Bucher's iconic Dookie album artwork. 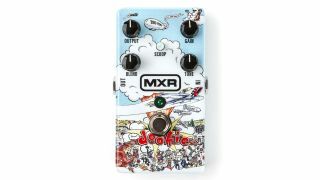 MXR is promising that the Dookie Drive is not just for Green Day fans and has plenty of application for fans of harmonic overdrive. MSRP is $271.41, with an expected street price of $189.99.